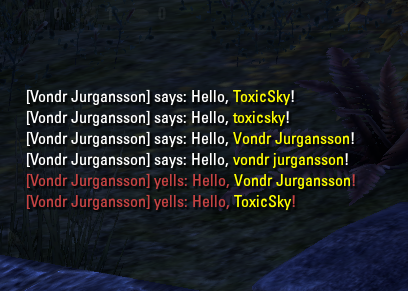 A small addon which changes the colour of either your user- or charactername when written in the chat. This is to make it simpler to notice when someone is writing to you in, for example, guild- or group-chat. This is still a bit of a beta, I have only tested it by myself so far and there are yet not settings for changing the colour of the name. It is currently in a bright yellow, system-like colour for simplicity. If you like this addon, give me a shout and I shall look into extending it with some manner of settings. T'was just something I threw together for myself to begin with, but thought I would share it here as well. Heya, just wanted to say that I LOVE the addon. Its something I've been looking to use for a while now. I was wondering if there was a way you could add a custom name to it? Like instead of "Jimmy John James" it will highlight "Jimmy" in addition to the full name. Or Instead of "@BobbyTheBestPersonEver" it will highlight "@Bobby". 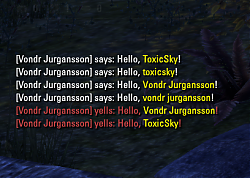 My char/@name is so long nobody ever bothers to spell it out completely. That is agreat idea and I shall look into this! Such feature should be possible, for sure. Am a bit swamped at work right now, but shall try to implement it as soon as possible.